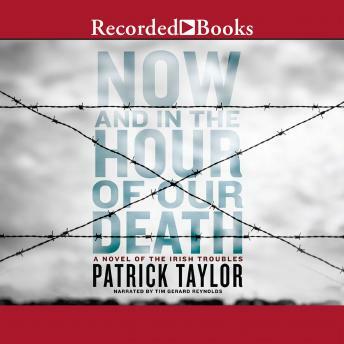 Patrick Taylor's first novel of the Irish Troubles, Pray for Us Sinners, introduced us to Provisional IRA bombmaker Davy MacCutcheon and the love of his life, Fiona Kavanagh. Davy planned to leave the Provos after one final mission. But the deadly mission backfired, and Davy ended up in prison. Six years later, in Now and in the Hour of Our Death, Fiona Kavanagh has found sanctuary in Vancouver, Canada. But news of a breakout at the Maze prison brings back memories she thought she'd left behind. Especially when she discovers that Davy is one of the escapees. Davy's desperate to go to Canada, but in exchange for the forged documents he needs to join Fiona, he must help one final attack against the British soldiers. Can Davy's love for Fiona transcend his commitment to a cause that led to his imprisonment? Will Davy threaten the peace Fiona has found in Canada? And does Fiona want him to? From secret IRA meetings in tense County Tyrone to the easy tranquility of Vancouver, Patrick Taylor describes with delicate precision and painstaking detail the events that set the escape plan in motion. This is a haunting, exultant prayer to the lives of those bound by the ties of patriotism and the intimate battles we fight to release our hearts from the fetters of love and loyalty.